John Ostell, son of English saddler Isaac Ostell and an immigrant to Montreal in 1834 at the age of 21, was Montreal’s most important architect in the years 1836-59. He changed the face of the city with his design of some 25 major religious, civic and industrial buildings, as well as with his extensive surveying activities. Chronicling all his business activities is daunting, so it is not surprising that what hasn’t been noted was his commitment to the Montreal Mechanics’ Institution (MMI est. 1828) and its successor organization, the Mechanics’ Institute of Montreal (MIM est. 1840). Perhaps literally just off the boat, John Ostell was proposed for membership in the MMI on January 14, 1834, by ordnance officer William Antrobus Holwell and painter William Boston. He was elected to the MMI’s Committee of Managers the following year. Patterned after earlier institutes established in Glasgow and London, the MMI and MIM were set up in Montreal to offer technical courses and library support for working men in the new industrial age. He must have considered it a useful organization because he served on its committees and executive intermittently for years—and he wasn’t a man to waste his time. Ostell served as president of the MIM from June 1845 until November 1846, and the minutes indicate that he presided at more than two-thirds of the 33 management committee meetings held during his tenure—so he was no absentee landlord. 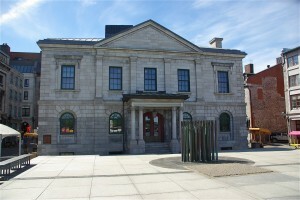 It was during his term of office in 1845 that MIM was incorporated under the laws of the Province of Canada; the organization is now known as the Atwater Library and Computer Centre. Legend has it that as a young lad of 17, John Ostell had visited Montreal, assessed the situation, and went back home to England to take surveyor and architecture training. After his arrival in Montreal to stay four years later, he apprenticed himself to surveyor (arpenteur) André Trudeau where he learned Quebec practices in the surveying business and presumably honed his French. By July 1834, he had earned his surveyor’s certification (brevet de clériclature), and was on his way to a spectacular career in surveying and architecture. He would sign himself, as the work warranted, as a surveyor, architect, or engineer. In November 1835, he received his first major architectural commission, to design the Customs House on Place Royale, and the building was completed in 1836. It is now part of the Pointe-à-Callières museum. Among smaller commissions at the time, he renovated a rental building for auctioneer and commission merchant Austin (Augustin) Cuvillier—also a Mechanics’ Institute member. The building is now called Maison Cuvillier-Ostell at four rue Notre Dame Street at boul. St. Laurent in the heart of Old Montreal. One of his first residential commissions was to design a house for lawyer Alexander Buchanan, a gracious building completed in 1837, still located at the corner of Sherbrooke and de Bullion in the area then known as Côte-à-Baron. The same year he designed twin houses for American-born railway and steamboat engine builders Samuel and Lebbeus Ward, on Wellington Street at King. In January 1837, he married Élisabeth-Éléonore Gauvin, whose brother Dr. Henri-Alphonse Gauvin was a Patriote leader during the 1837 Rebellion and died as a result of sickness contracted while he was imprisoned. John and Éléonore Ostell were to have at least eight children, four sons, and four daughters. His eldest son, Charles Joseph Ostell, born 1837, became a member of the Mechanics’ Institute on December 23, 1850, at age 13—presumably to take the drawing and other courses then offered at the Institute. John Ostell’s marriage into a Roman Catholic family gave him an entry into the world of the ecclesiastics, and he secured significant commissions from the Sulpicians and the Roman Catholic diocese, including the towers of Notre Dame Church (1841-43) that were later destroyed by fire; and, in 1849-51, the Episcopal Palace–which burned during the major conflagration in Montreal in 1852. Also in 1851-54, he constructed the Church of St. Ann’s in Griffintown for the Catholic English-speaking Irish population of the area. Ostell’s surveying business also flourished. He replaced Jacques Viger as roads inspector in Montreal in 1840, and from 1842 to 1847 was city surveyor, responsible for building and maintenance of city streets. He drew up the first comprehensive city plan of Montreal. As city surveyor, he automatically sat as a member of the Corporation of Montreal, the chief administrative body of the city. He was a provincial surveyor, 1848-51. In the early 1840s, he produced the plans for dividing some of the Séminaire de Saint-Sulpice lands on the Lachine Canal (St. Gabriel farm area) into saleable lots. In the process, he acquired some of those lots, some of which he re-sold to John Redpath—a profitable investment for both men, whose later factories needed access to hydraulic power from the St. Lawrence River canal system. Though he spent most of his time in Montreal, Ostell made forays into the countryside, probably in his capacity as provincial surveyor. In 1848, he produced a map of the propriétés de feu of William Yule in Chambly Township. This map, now in archives of the Société d’histoire de la Seigneurie Chambly, shows a cotton spinning mill (1842), the seigneurial manor houses of Gabriel Christie and Samuel Hatt; the plan of the mill race and locks in the Richelieu river which fed the seigneurial flour mill; and the Willett carding mill. In 1853, he undertook the planning of Notre-Dame-des Neiges cemetery for the Fabrique of Notre Dame, plans later expanded by his nephew Henri-Maurice Perrault. Ostell’s second major architectural commission was in the educational field: he won the competition in July 1839 for the first buildings of McGill University, whose patrons were looking for buildings that would symbolize English Protestant education in a French-Canadian milieu: the Arts building and the East Block (now Dawson Hall) were constructed 1839-1843. When the Province of Canada was formed in 1841 resulting from the Union of Upper and Lower Canada, and the capital was to be in Montreal, it is noted in Wapedia that John Ostell was commissioned to renovate St. Anne’s Market (where Place d’Youville is today) to accommodate the new parliament. Sadly, the building and the archival treasures therein burned in an anglophone-instigated uprising in 1849. By 1843, only ten years after his arrival in Montreal, and when just over 30 years old, Ostell was appointed one of the city’s 40 justices of the peace, a position requiring substantial financial and property resources. 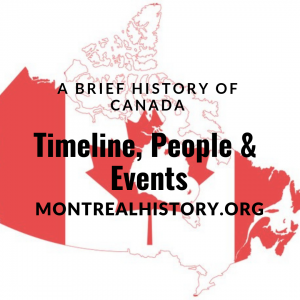 In that select group were some established Montreal figures who were Ostell’s patrons at various times: Jacques Viger (Customs House commission); George Moffatt (McGill University commissions); Peter McGill (president, Bank of Montreal) and James Ferrier (mayor of Montreal in 1845). Ostell worked extensively with contractor John Redpath, beginning about 1840 when Redpath was president of the Mechanics’ Institute and chairman of the city’s Committee on Roads & Improvement. Redpath hired John Ostell to plan the sub-division of his large property known as Terrace Banks, located northwards from Sherbrooke Street at Mountain. Ostell designed Redpath’s Canada Sugar Refinery which opened on the Lachine Canal in 1854—Canada’s first major industrial enterprise, a complex which included a boiler house, filter house, kiln house, carpentry, and paint shop, melting house and several warehouses. Some of the buildings are now a condominium complex. At the beginning of the 1850s, Ostell was instrumental in the formation of the Saint-Gabriel Hydraulic Company, joining with businessmen John Young and Jacob De Witt and miller Ira Gould to purchase Seminary lots that could be resold to companies seeking to use the hydraulic waterpower that had become available with the reconstruction of the Lachine Canal 1843-48. The water held upstream in the canal locks could be channeled and used to turn wheels or water turbines, and industries needing such power could rent hydraulic lots from the those holding the rights to the land. It was a profitable investment for the businessmen concerned. Another of Ostell’s major commission was the Sulpicians’ Grand Séminaire de Montréal, on the north side of Sherbrooke Street at Fort. He was the architect in charge of construction, 1854-57. When the Collège de Montréal was built in 1868-70 just adjacent, the whole complex became one of the most imposing in Montreal. Ostell’s firm, Montreal Door and Sash Factory, established in 1852 following what was probably an earlier lumber venture in 1848, was next door to John Redpath’s Canada Sugar Refinery on the Lachine Canal. His company advertisements touted doors, sashes, blinds, architraves, skirting boards and moldings, planks, scantling, furrings, laths, and shingles. Ostell invested some £20,000 in the enterprise, had five acres with buildings and machinery, and employed 75 men. He sent some of its products to the Paris Universal Exhibition in 1856. The shop produced materials for markets in Lower and Upper Canada and exported to the U.S., Great Britain, and Australia. In the early 1860s, Ostell seems to have had financial difficulties, and the factory was sold to William Molson, but Ostell later rented it back, and in 1886 it was still described as an important manufacturing business; Ostell was still its manager. Ostell maintained a long-standing interest in lighting. He became involved when many prominent Montreal citizens including Moses Judah Hays, François-Antoine LaRocque, Jacques Viger, William Bingham, and John Redpath–with Albert Furniss as manager—promoted the establishment of the Montreal Gas Light Company in 1836. 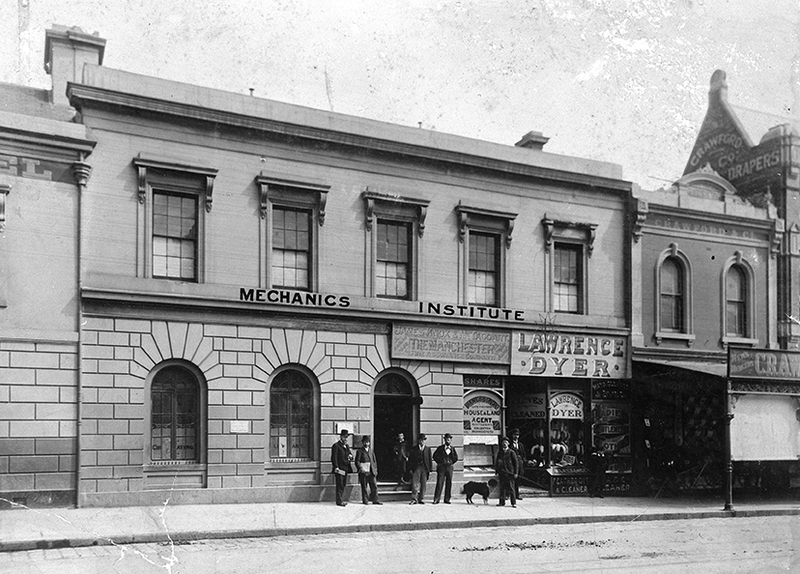 It provided the gas lighting for some stores and expanded by 1838 to lighting a few streets, and by 1840 its business included such items as providing the lighting for the rented rooms of the Mechanics’ Institute. Later, having withdrawn sometime previously from that earlier company, Ostell joined in 1847 in the formation of New City Gas, of which he became a director in 1850 and president in 1860-65. For this company, he designed his last building in 1859, an industrial structure at 956 rue Ottawa which now houses an art studio. 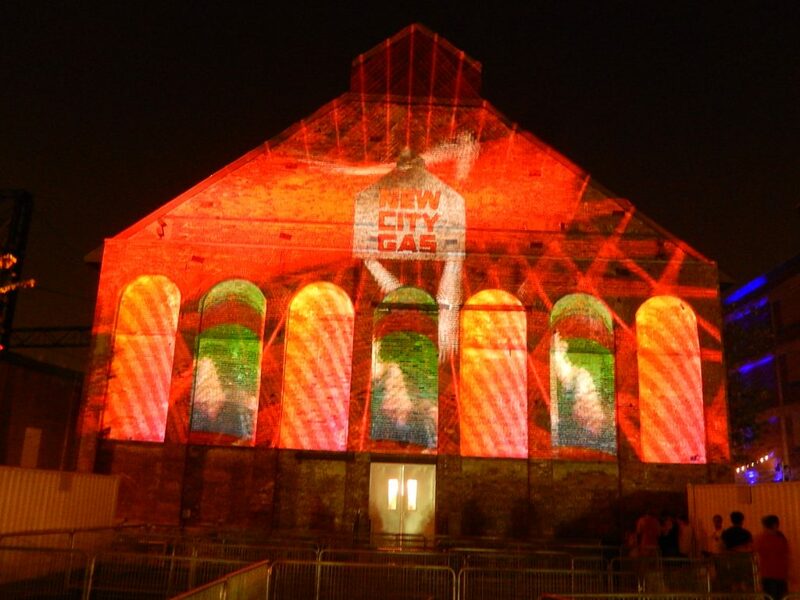 New City Gas eventually evolved into Gaz Métropolitain. Passenger transportation was another Ostell interest. In 1846, he produced a plan for the Montreal and Lachine Railroad. He was involved in the Montreal and New York Railroad, the Carillon and Grenville Railway Company, the Industry Village and Rawdon Railroad Company; and the Montreal & Champlain Railroad (of which he was president 1859-65). In 1861, he founded—with William Molson and others–the Montreal City Passenger Railway Company to provide horsedrawn public transport. That company was a forerunner to today’s Société de Transport de Montréal (STM). Insurance was among his other business interests, and he was president in 1887 of the Royal Canadian Fire Insurance Company of Montreal. Aside from his business interests, John Ostell and his family seem to have participated to a limited extent in other city activities. In addition to the Mechanics’ Institute, he was a life member of the Natural History Society, and its president from May 1850 to May 1852. Mrs. John Ostell was vice-president of the Roman Catholic Orphan Asylum in 1867-68; her husband had built the Protestant Orphan Asylum in 1848. An Anglican from birth, John Ostell (1813-1892) was received into the Roman Catholic Church shortly before his death and was buried beside his wife in a 300-ft. plot in Notre-Dame-des-Neiges cemetery that he had purchased in 1854. His married daughter in England was his only surviving child, but he did have several grandchildren, including brothers Capt. John Benjamin Ostell and Col. Joseph Thomas Ostell, both of whom served in the North-West Rebellion of 1886; and Edouard Sydney Ostell.